A new, larger Clay Gun. Barrel is 14" long, 2 1/4" diameter. Very well made. 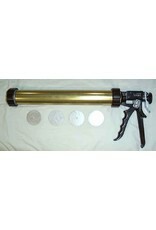 Extruder gun comes with 4 dies (1/4" round, 1/2" round, 3/8" round, and a blank).